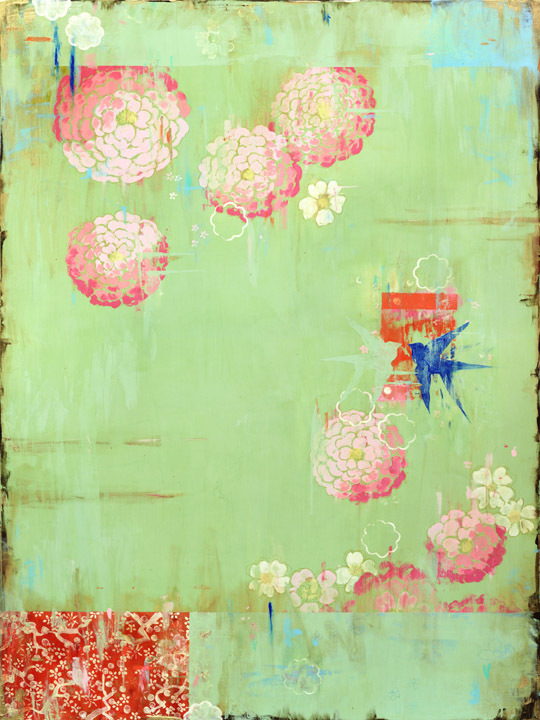 It’s a real honor to have my painting “Kaleena” included in Lilla Rogers’ new online marketing/licensing course. Thank you Lilla! 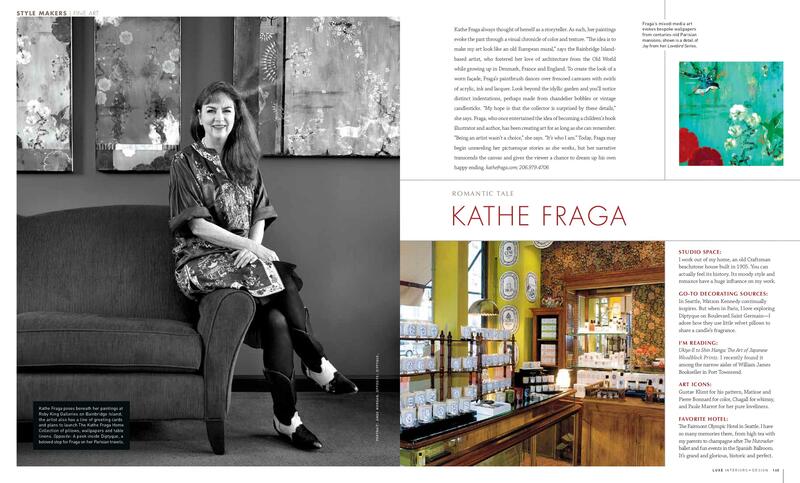 “Style Maker 2013”: Thank you Luxe Magazine for featuring Kathe Fraga art! It was a thrill to be selected by Luxe Magazine, interiors +design (Pacific Northwest Edition) for their “Style Maker” section in the new Spring 2013 issue. I really want to give a huge TY to the Luxe team who were wonderful to work with: Jesse Bratter, Features Editor; Yelena Moroz, Writer; Olivia Lambert, Art Director; Amos Morgan, Photographer. The photo shoot was at Roby King Galleries and as always, Wes King and Andrea Roby King did everything to make the day. Exciting news! 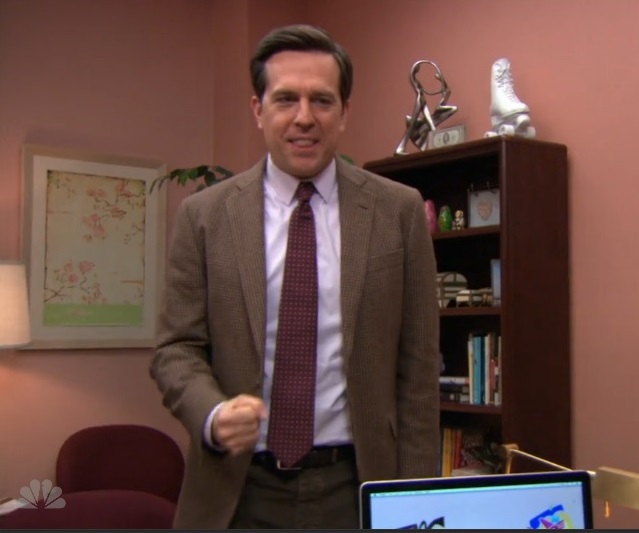 Two of my paintings “Remembering I and II” are on “The Office”–one of my favorite shows. 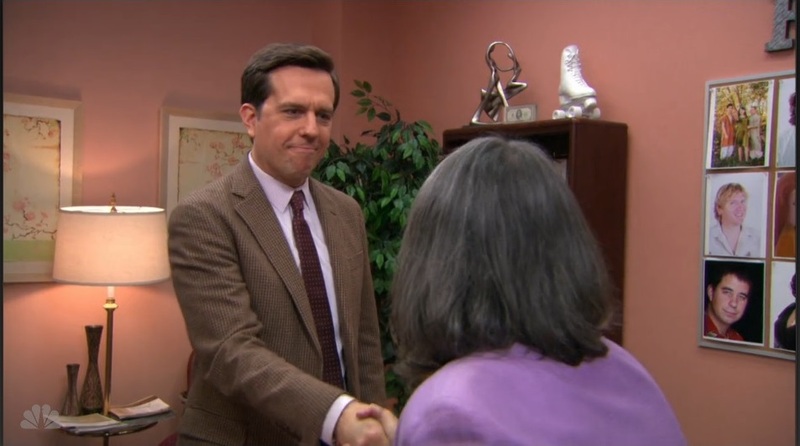 Here’s the screen shot with Ed Helms “Andy” and Roseanne Barr. The originals are available through Kaller Fine Arts. And a BIG thank you to Grand Image, Seattle for the placement! After six months of painting, with pattern and color whirling and twirling and dancing over my canvases, the 16 new paintings for my February solo show at Roby King Gallery have left and are happily on display. It is a mysterious path from studio to gallery. In the studio, the paintings group together, some not quite completed, others just beginning, still others that are “all done” but then aren’t. And then, suddenly, after all that time spent together, out the door they all go–canvases filled with stories and thoughts, and memories and history. The beach has beckoned since the opening. Neglected since the intense work in the studio, it welcomes me back with the treasures I love. 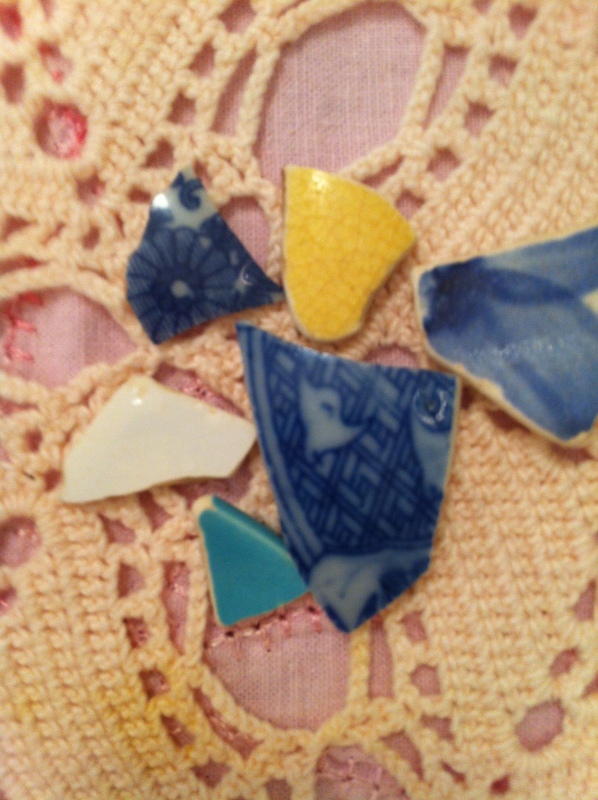 Such inspiration, these little shards of old, tumbled Blue Willow china and yellow faded pottery. 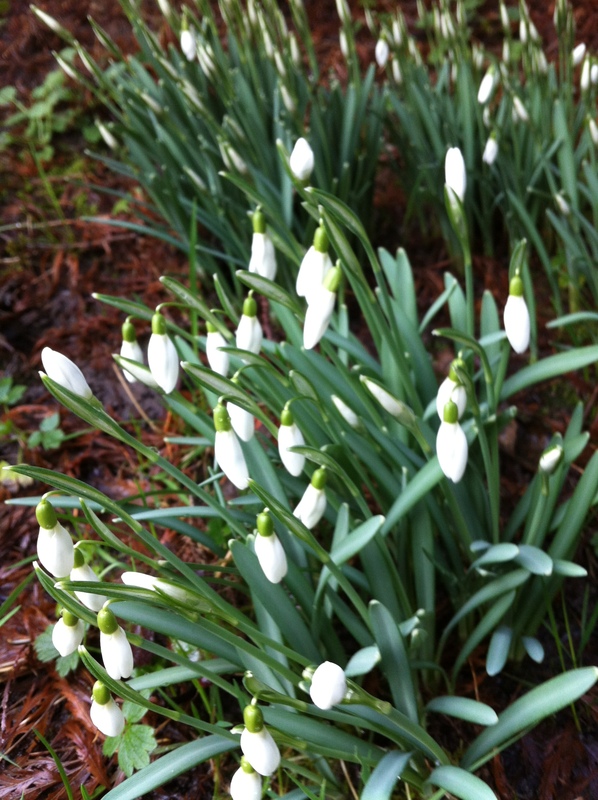 And the bulbs are popping up–the snowdrops in drifts under the ancient and gnarled Japanese Maple (named Lulu) are so fresh and so lovely. I want to paint white flowers, Masses of them! 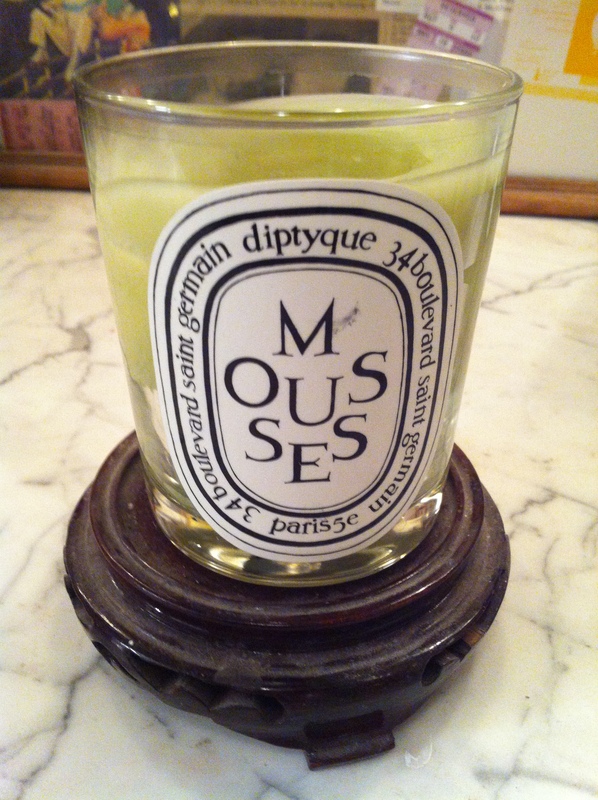 And, ever present in the studio, the scent of a Diptyque candle. The paintings for February’s new show were accompanied by the daily sweet scent of a new favorite “Mousses”, described thusly: “the “fresh green perfume of moss”.” Perfect for our beautiful rainy and foggy and misty and magical Northwest! Painting weather, for sure! “Live the dream in 2013”! 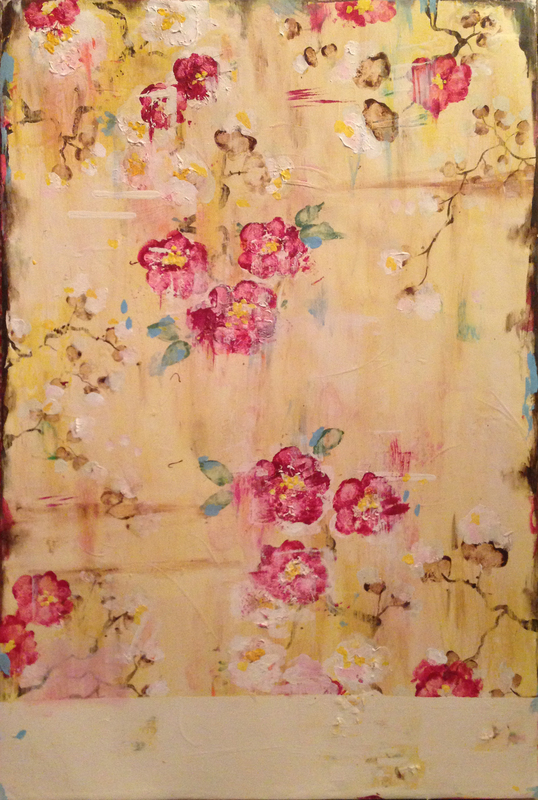 I’ve been busy in the studio these last few months and Ij’m looking forward to sharing my new paintings with you. There’s “The French Wallpaper Series,” featuring the soft, timeworn and faded floral inspired wall coverings from grand, old Parisian mansions. 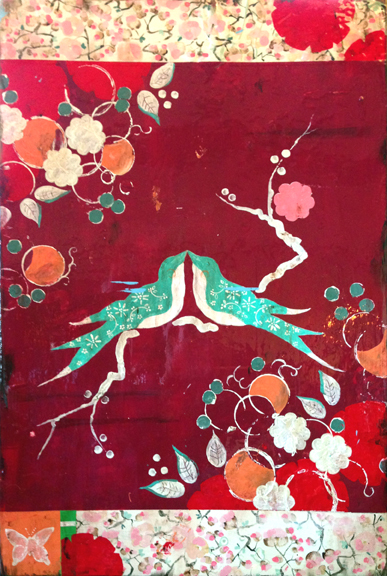 And also, “The Lovebird Series,” influenced by the more vibrant and bold colors of vintage chinoiserie from the 17th and 18th centuries. Thank you for taking a peek at my new work. Here’s wishing you a fabulous December and a wonderful New Year! 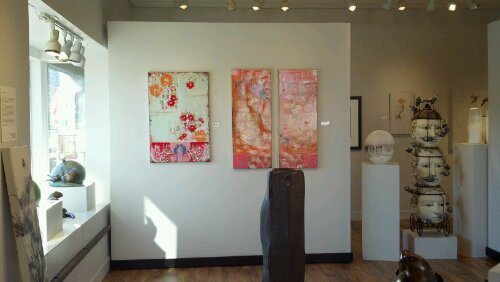 It’s an honor to now have my work represented by Ruth Offen at her beautiful Waterworks Gallery in the San Juan Islands. Ruth, very kindly, traveled over to my island–Bainbridge–to visit my studio and have lunch together and I can’t say enough about how much I appreciate her interest. We had a wonderful afternoon and I’m looking forward to working with her. If you have a chance, please check out the Waterworks website which includes many of my favorite artists including Whidbey Island sculptor Georgia Gerber. Ruth also has a delightful blog and the gallery is on Twitter–please follow! It is such an honor to have my work featured on Rona Wheeldon’s beautiful blog Flowerona. I’ve been following Rona’s blog and tweets for a very long time and always am so inspired and energized by her beautiful posts. Rona is passionate about all things floral! She’s based near London and is a columnist for Wedding Flowers magazine. Rona also writes a quarterly column for Flower Arranger magazine. In addition, you can find Rona’s work on the online interior design magazine HeartHome. Jared Flood, Churchmouse Yarn and Tea Bainbridge Island, photo shoot at our house. Thank you recent September for your morning of grey and mist! Jared Flood, flying into Bainbridge Island from New York, (knitting superstar and fab photog and very nice guy! 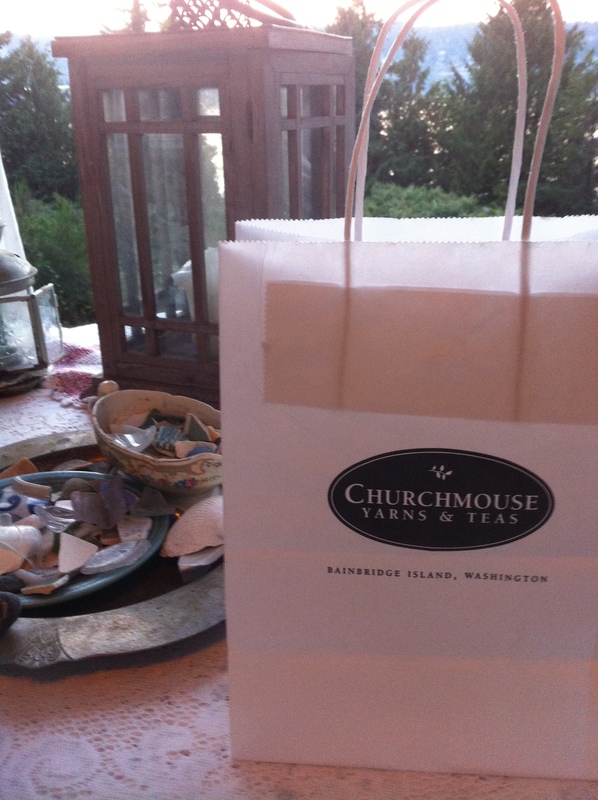 ), staged a photo shoot at our old beach stone 1905 home to catalog a series of upcoming Bainbridge Island knitting shop designs for Holiday 2012. 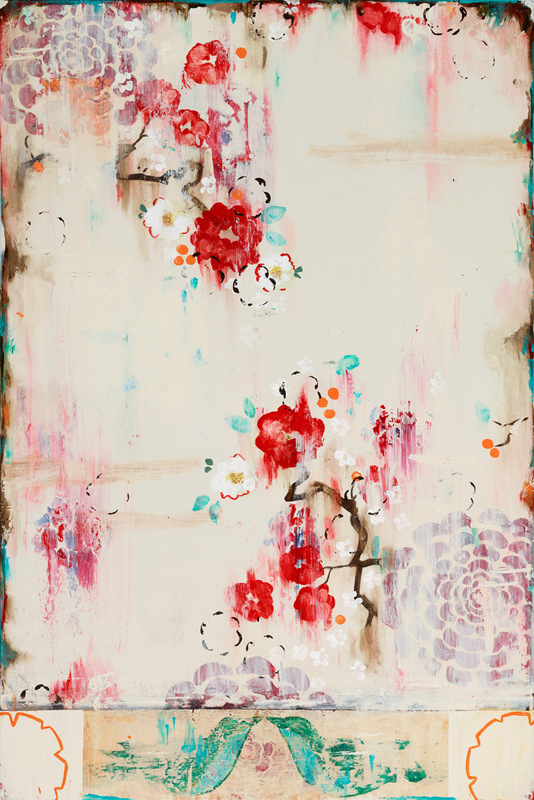 My frescoed paintings, with their texture and scraped surfaces, reveal stories that are inspired by tales of old motifs and Paris walls: it was lovely to share my studio paintings with Jared and crew, plus the new Kathe Fraga 2013 silk pillow collection and greeting card lines inspired by French/Asian age-old motifs. Thank goodness it didn’t rain! It has been an honor to be a part of the 8th annual DIFFAglam auction hosted by Masin’s Fine Furniture in Bellevue. DIFFA (Design Industries Foundations Fighting Aids) will be hosting an auction evening of fun and fabulous dinners and wine pairings. Plus all sorts of beautiful items to bid on. The tablescape I will be designing is for one of Seattle’s most popular restaurants–Rover’s! Who doesn’t know “The Chef in the Hat” Thierry Rautureau? He’s recently been involved in the hit TV series “Top Chef Masters“–what a show! And for the table, my inspiration comes from Thierry’s love of texture, color, taste and surprise. He creates magic with unexpected pairings! 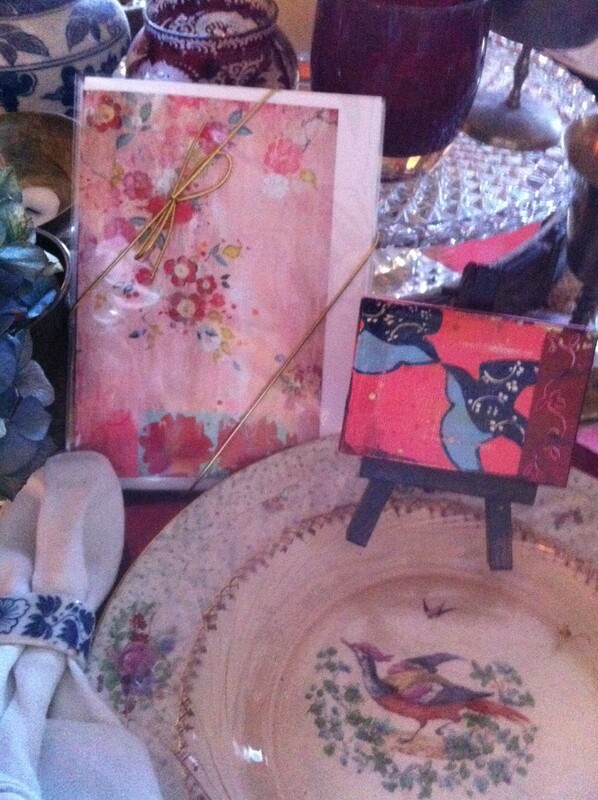 So look for lots of color, pattern and layers,( much like my paintings) –I’ll be including vintage heavy linens, found objects, 100-year-old estate bird china, French pressed glass (pink! 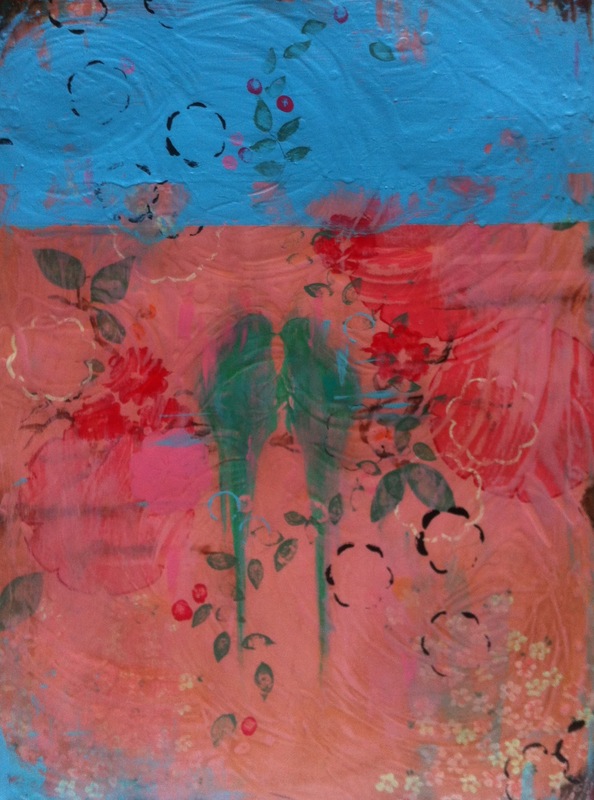 ), 4 original miniature Kathe Fraga paintings for each plate, along with Kathe Fraga greeting card sets and Thierry Rautureau inspired hats!